The best place for outdoor school furniture. We guarantee great prices and customer service. We have over 20 years experience servicing the outdoor school furniture industry. Heavy Duty Construction. Contact Us today for a discounted quote! Outdoor School Furniture specializes in Outdoor Tables, Expanded Metal and Wood Picnic Tables, Outdoor Benches, Bike Racks, and Much More! 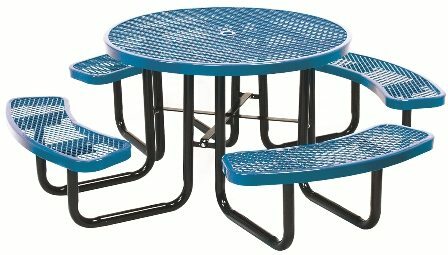 Our School Picnic Tables and Umbrella Picnic Tables come in all sizes, shapes and colors, and we carry a complete line of Buddy Benches, Personalized Perforated Benches and Outdoor Trash Cans and Receptacles. If you are searching for quality Outdoor School Furniture, Tables, Benches, and Picnic Tables, we would enjoy working with you on your project!